When a trendy, underground dinner club leaves some guests six-feet-under the table, entertaining professional and amateur sleuth Sophie Winston hopes she has all the right ingredients to put a murderer on ice in New York Times bestselling author Krista Davis’s new Domestic Diva mystery . . . Domestic diva Sophie Winston can whip up an elaborate event in her sleep, but as the hippest hostess she rarely gets to enjoy the full guest treatment. Which is why her best friend Nina Reid Norwood loops her in to the latest culinary craze: a pop-up gourmet dinner party. The celebrity chef, the epicurean menu, and the high-profile attendees are all a surprise, turning the decadent dining experience into the hottest ticket in Old Town. But Sophie’s just pleased as punch that she finally has an opportunity to join her fellow foodies in some fun. The posh party proves to be a recipe for disaster when Hollis Haberman sours spirits by bringing his own hot new dish—his young trophy wife. With Hollis’s son and ex-wife in attendance, there may be more heat at the table than in the kitchen. But by aperitifs, Sophie discovers Hollis swallowing his last bits of air, and she must scramble to stop a killer before the swanky supper becomes anyone else’s last meal. 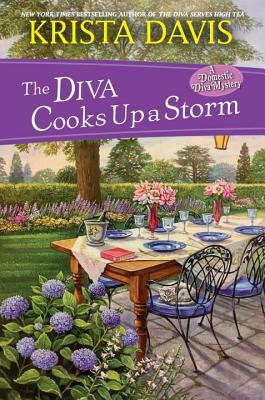 Krista Davis is the New York Times bestselling author of the Domestic Diva Mysteries and the Paws & Claws Mysteries. Several of her books have been nominated for the Agatha Award. Krista lives in the Blue Ridge Mountains of Virginia with two cats and a brood of dogs. Her friends and family complain about being guinea pigs for her recipes, but she notices they keep coming back for more. Visit her website at www.kristadavis.com.